Via 2010 MA graduate Esmeralda Munoz Torrero, I was introduced to the concept of ‘late photography’ as coined by David Campany in his book ‘Safety in Numbness: Some Remarks on the Problems of “Late Photography”’ (2003). ‘Late photography’ record the consequences of events after they have happened, their aftermath. Of particular interest to me was the work of Canadian photographer Robert Polidori who photographed houses devastated by flood waters in his series ‘New Orleans after the flood’.He also took photographs of the abandoned buildings in the no man’s land around Chernobyl/Pripyat, the Chateau de Versailles under renovation and grand buildings of La Havana left to slowly decay. I was first drawn to his visual style, with very vivid yet slightly faded colours, with a kind of ‘technicolor’ feel to them, not the type of strong colours you get in commercial photography. His pictures are both very sharp and detailed, yet they contained ambiguous shadows. This is exactly the type of visual feel I try to achieve myself, a feel I describe as cinematic. Indeed, Polidori works exclusively with natural light and long exposures, the way I do. He says that ‘the grammar of [his] pictorialism comes from pre-Renaissance and Renaissance perspective’. As a joke, Polidori compares his use of long exposure to spirit photography because he too aims to ‘reveal an inner truth’. ‘ When images are soft, they just remain evocative, or in your imagination. You get a mood, and it remains on the emotional level. The viewer has to put more of him or herself into it. When there is more detail, it’s like that old expression: There’s no fiction stranger than reality. Reality will compose the most extreme paradoxes and contradictions and adjacencies, which can’t be understood. I absolutely loved this concept of camouflaging emotional manipulation aimed at the viewer behind an apparently straightforward, documentary style, making it all the more efficient that it is surreptitious. ‘I’m interested in interiors, and I have been for a long time, simply because they’re indices of individuals’ personal values. They tell you a lot about the individual. Like I’ve said before, to me interiors are both metaphors and catalysts for states of being. You can take a portrait of somebody, and you might have a feeling looking at their face, but you know less things about them by looking at their face than you do when you look at the way that they compose their own interior space. What interests me are their values.’ He compares his work to that of ‘collecting evidence, like a detective looking to solve a case’. 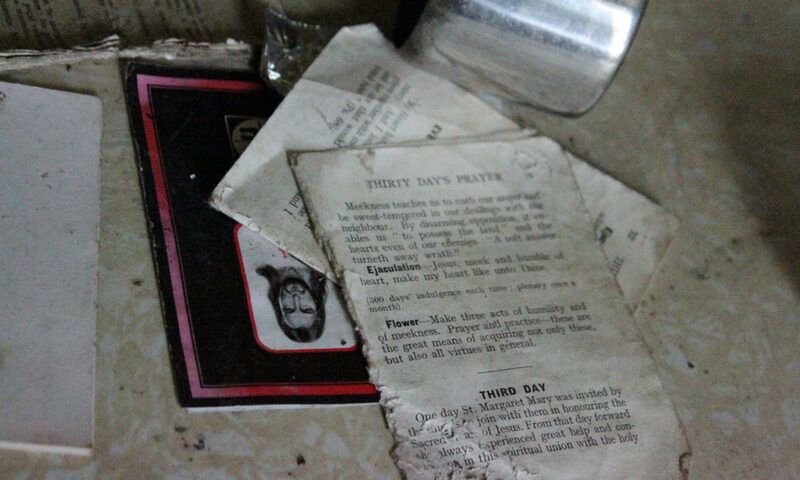 That’s exactly how I feel about my Ghost House series: what fascinates me is trying to put back together the lives of their former inhabitants, gues who they were based on the belongings they left behind. In an interview with Bombsite Polidori explains that he first became interested in rooms after reading a book about the Pythagorean School, where students would memorize empty rooms as a mnemonic aid to memorize events: rooms were turned into ‘a locus for memory’. Polidori himself views rooms as ‘ metaphors for states of being’. What interested him in his photographs of Versailles under restoration was the concept of ‘historical revisionism’: ‘when you choose to restore a certain room as it was in a certain period, the period you choose is based on your contemporary worldview. Each point of view of the present has its harmonics in the past.’ The Palace told as much about France of the Mitterrand years as it did about the times when it was built. He explains ‘what we are looking at in these museum restorations is the society’s superego, what a society thinks of itself, and how it thinks it should be seen by itself’. I found this idea that a room reflects the philosophical values of its inhabitants fascinating. I think this is a similar concern that draws me to the religious imagery found in the Ghost Houses, what they say about the world-view of their former inhabitants. In the context of the Magdalene laundries, this religious imagery takes a darker undertone, when one contrasts the message of Jesus with the arbitrary imprisonment of innocent girls. Here indeed, we find society’s Superego, the values it claims to follow, clashing with the actual actions. All in all, I think Robert Polidori is the photographer I feel closest to among all the artists I discovered in my research, both on the visual and philosophical levels. Velours Frappé, Salles Du XVIIème, Versailles 1985. All images courtesy of the artist. Marat De David, RDC, Aile Du Midi, Versailles 1985.